Why aren't some morphs showing up in the Shaping pane? In DAZ Studio 4.5 the way that the Shaping pane handles morphs without a region assignment has been made consistent (before it was sometimes showing the morphs, sometimes not). As a result, until the morph sets are updated some of them will not show in Shaping - they will be available in the Parameters pane, under the main Genesis node for shaping morphs and on the relevant body part for "posing" morphs" (e.g. expression morphs will be on the head node). Why are some of my morphs and shapes missing from the Shaping pane in DS 4.5? Why does DAZ Studio 4.5 ask me for a file name every item I save a scene? When saving a scene DAZ Studio 4.5 now looks at the user information entered in the application (Edit>Preferences>General) and compares it with the information in the file. If they match (and aren't both empty) then the save will not ask for a name, if they don't match (or are both empty) then you will be asked for a file name every time you try to save the file. This was done to reduce the chances of accidentally overwriting content files, while allowing the user's own files to be saved with a key press. 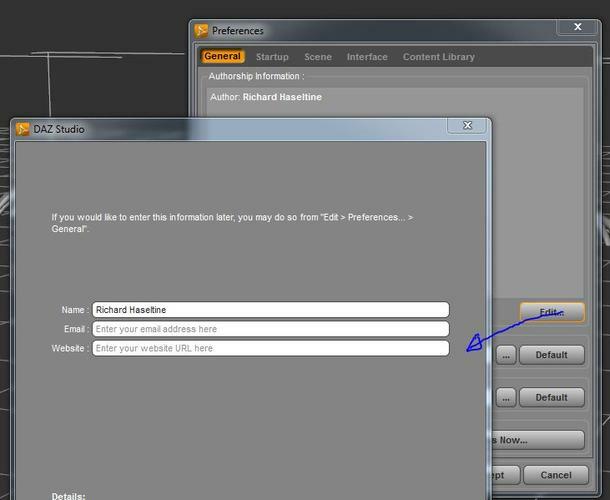 To enter user data go to Edit>Preferences>General and click the Edit button under the Authorship Information box. This information will be added to all files you save, so if you plan to share scenes or presets (especially with the public at large) make sure you are entering only the details you are willing to make public. Why am I being asked to save my current scene when I double-click a new scene to add in DAZ Studio 4.5? With the introduction of the ability to save a Scene subset as well as a full Scene, DAZ Studio 4.5 now has two different default actions for scene-type files - anything saved as a full Scene (File>Save or File>Save as>Scene) will by default Open, closing the existing scene (which is why you are asked if you want to save your work, should the scene in the viewport have been altered) while a Scene subset will by default be merged into the current scene. Files will show their type (scene vs Set) via an overlay on the thumbnail in the content pane. You can still merge a full Scene into the current scene, or open a Scene subset in place of the current scene, by right-clicking on the file in the content pane and choosing the appropriate command from the context menu - the change affects only the default action, the result of a double-click. If you use the Victoria 4 for Genesis 2 Female product to enable the use of character maps for Victoria 4 on Genesis 2 Female you will need material files that are in .duf format, rather Poser-format .pz2 or .mc6 files or DAZ Studio .dsa or .dsf presets. If those are not provided conversion is a simple process. Ideally, you should load Victoria 4 and apply the non-.duf preset you want to convert to the figure - you can use the original Genesis if you don't have Victoria 4, but you will lose any settings for the transparent eye surface (often used to provide reflections). Having applied the textures to Victoria 4 go to File>Save as>Materials preset, pick your save location and name (e.g. People>Genesis 2 Female>Materials>Victoria 4 Textures, Marie-converted.duf) and then click Accept on the options dialogue. You should then be able to find the saved files in the Content Library pane (e.g. under DAZ Studio Formats>My Library>People>Genesis 2 Female>Materials>Victoria 4 Textures). Why do I get coloured blobs on my renders? Use ray-traced shadows instead of depth-mapped shadows - select your lights and if there is a Shadow group in the left column of the Light or Parameters pane click to seelct that group of settings, then check the Shadow Type property. If it is set to Deep Shadow Map switch it to Raytraced (Software only). Note that ray-traced shadows can be slower than mapped shadows, especially if there are a lot of transparent or semi-transparent surfaces in the image. Lower the intensity of your lights so that the total adds up to no more than 100%. This may make your image too dark, but you can compensate with the Gamma setting in the Advanced tab of Render Settings. Try slightly adjusting the position or rotation of your camera - sometimes that will remove the issues. Why has my interface gone white? How can I get it back? If the interface style definitions used by DAZ Studio become corrupt, as can happen following installing an updated version of the application while the current version is running for example, then the interface elements will turn white-on-white. The fix is to make sure DAZ Studio is closed, then uninstall and reinstall both the application and, if you have a license, the Dynamic Clothing Control plug-in (in that order - the Dynamic Clothing Control plug-in needs to be installed after DAZ Studio itself) to rebuild the missing files; the content and all other plug-ins can generally be left in place without conflicts during this process. Where has the command to load a backdrop image gone? In DAZ Studio 4.7 a new pane, the Environment pane, has been added. This replaces the Edit>Backdrop command, and any toolbar buttons that triggered the same function. To open the pane go to Windows>Panes(Tabs)>Environment. By default no backdrop is set, to add one use the Active Type button and set it to Backdrop. This will enable a colour bar for setting the backdrop colour, with a triangle button beside it which allows selection or loading of a backdrop image. There are additional buttons to rotate or flip the backdrop image, and to control whether the backdrop is rendered or shown only in the preview. One way to have the Environment pane launched, or brought to the front of its tab group, in the way that the old Backdrop dialogue worked is to use this script http://docs.daz3d.com/doku.php/public/software/dazstudio/4/referenceguide/scripting/api_reference/samples/specific_ui/environment_pane_as_backdrop_dialog/start - simply download the file using the link about the code box, place it in your Scripts folder, and make it into a Custom Action by right-clicking on it in the Content Library pane and selecting Create Custom Action to add it to your Scripts menu; then, if desired, go to Window>Workspace>Customise and drag the command from Custom Actions on the left into a toolbar on the right in the Toolbars tab. Where has the command to change the viewport colour gone? In DAZ Studio 4.7 the command to change the viewport colour has been removed from the viewport option menu. The viewport colour is also no longer rendered - it is used solely for the preview mode. To change the viewport colour go to Window>Style>Customise colours - the Viewport colour is at the bottom of the dialogue. To change all viewports uncheck Use Independent Viewport Colours; to change only the active viewport check Use Independent Viewport Colours. Why are the blank areas of my image not masked? How do I get the promised halo-free image? In DAZ Studio 4.7 there has been a change in the way backdrop colour and transparency masks (alpha channels) are handled. If you have chosen Backdrop for Active Type in the Environment pane then by default it will be set to render and the transparency mask saved with a Tiff or PNG file will include the full image, including the background areas that would have been masked out in previous versions. To generate a transparency mask/alpha channel that covers only the geometry, and which will now not blend in the backdrop colour, you must go to the Environment pane and either set Active Type to None or set Visible in Render to Off. Is there a way to add extra content to Scene Builder? Yes, there is. In fact, it’s [intentionally] quite easy to do too. The first thing you’ll need to understand is that the current implementation of Scene Builder uses metadata to populate its views. More specifically, it uses categories, and in certain cases - such as Poses - compatibility information, to determine what should be shown. If the CMS is not running, Scene Builder will “fall back” to an earlier implementation that functions a bit differently - less of a multi-page wizard, more of a multi-list dialog without the “smart” functionality. *An alternate method of assigning the category would be to right click on the icon (in either Smart Content or Content Library) and choose the Categorize… option from the menu. In the Select Category dialog that pops up, navigate to, and then check the box adjacent to, the Categories > Default > Scene Builder > Female Character category. **These categories are not displayed in the Smart Content pane unless the target figure is in the scene and that figure is selected. One additional note here…. If you are dragging and dropping from the Content Library pane you can actually select assets that are not already set as being compatible with the selected figure and through the course of this action establish compatibility. If the asset hasn’t yet been assigned a type, a dialog will be displayed prompting for one when the item isdropped. Although the Sun/Sky setting for Environment Mode blocks all other lights you can get the same result using Dome and Scene mode and setting Environment Map to None. If a map is currently assigned to Environment Map click the mini image thumbnail next to the slider and choose None from the menu - the Sun/Sky controls will then appear. In Iray, what happened to the Photometric lights? In the original beta for DAZ Studio 4.8 there were separate photometric spot and point lights, with their own entries in the Create menu. These have now been removed - instead, when you set the render engine to iray the photometric parameters will become available for the standard spot and point lights. Both regular and photometric lights in old scenes will be converted to the new type on opening the scene in the current version of DAZ Studio.